Though you’ve probably heard of the phonics method of teaching children and adults to read, you may not be familiar with what “synthetic phonics” (as opposed to other types of phonics programmes) entails. Generally speaking, most parents and guardians may use some form of synthetic phonics, but they are probably not being true to the process in its entirety. Synthetic phonics is now the preferred method of Learning to Read in the United Kingdom and elsewhere in the world. In a nutshell, it uses sounds (phonemes) instead of letters to help students blend (or “synthesize”) words. Surprisingly, children who are taught using this technique do not have to know (and preferably should not know) their alphabets until well after they learn the 44 phonemes (19 vowels and 25 consonants) that comprise the English language. Thus, starting off with the ABCs (commonplace in many homes) is actually in direct contrast to what synthetic phonic researchers suggest. Proponents of synthetic phonics have shown that children who are given a few phonemes to learn per day generally are able to “blend” them together to make words rather quickly. Even children with special needs (Autism, ADD/ADHD, Asperger’s syndrome, etcetera) seem to respond positively to this technique. Instead of worrying about spelling and the letter names, the children simply synthesize sounds to form words. For instance, if a student is taught the phonemes /k/, /a/, and /t/, he or she can quickly learn to “sound out” the word “cat”. Though the phonic spelling (k-a-t) does not match the English spelling of “c-a-t”, the child is still learning that words are made up of more than letters and that one letter can represent different sounds. 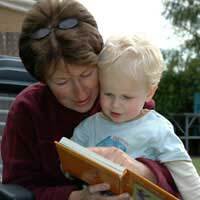 Eventually, children should be able to relatively efficiently and effectively begin to put sounds together, reading “books” and evolving their comprehension skills. From there, they can learn the alphabet song (A, B, C, D… et cetera) and proper spelling and punctuation to achieve fluency in their tongues. Where it can sometimes become tricky is when children are being taught differently at home than at school. If a parent is trying to instill the ABCs, contextual reading or sight word recognition in his or her son or daughter, the synthetic phonics process going on in the classroom might be comprised. At the very least, the child could wind up becoming quite confused. Consequently, it’s recommended that parents of very young children check with their local schools to see how they can start their kids learning to read in a way that will complement what the girl or boy will learn once he or she starts a formal education.